Apologies for a lack of posting since the 15th - it's been a strange month what with family emergencies and the sad, sad death of my garden (viciously murdered by stinkbugs). 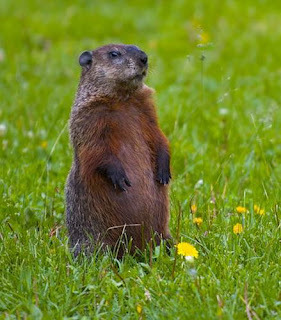 Frankly I suspect all groundhogs look alike -including the one making himself at home under our neighbors home. It's sitting vacant, except for an occasional visit from their teenage son to mow the grass. I haven't been able to catch him yet to ask permission to put the live trap on his property, so instead, it's been under our oak tree, where said groundhog breakfasts, lunches and has his dinner. See, our front yard is "downtown" for our groundhog, while the neighbor's house is the suburbs. He runs across our driveway to munch on our acorns, right after sitting up to wave at me, just like the photo above. Now here's the thing: he's awfully cute. But he will bite if cornered, and he's getting big. Bigger than our schnauzers. If he is a he, then he will just hibernate under the house till next spring, then continue to raid my garden. However, if he is a she, she will hibernate and have a lovely little family of 4-6 pups in the spring. When they are big enough, each one will want it's own burrow, making our house prime real estate property. The furry cutie has to go. So we have a live trap -one you open at one end, place food in the other end, and said groundhog wanders in to get the food, triggers the door, and is safely contained so he/she can be moved to a remote location. 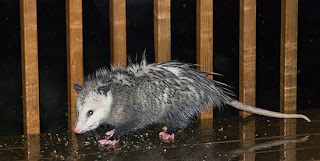 Unless the trap is set out under the acorn tree and an earlier diner guest shows up, in this case the possum from the back yard, who usually eats the cat food by the back door, and actually came inside the back door the other day to remind me I had forgotten to put food out for it. Turns out possum loves apples smeared with peanut butter as much as the ground hog does. 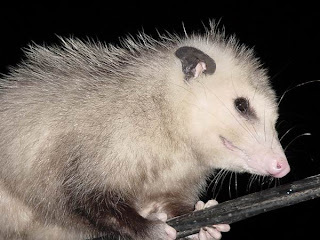 And possum got there first. Until he realized he was trapped inside WITH the apples and peanut butter, at which point he turned around and started eating. Then he went to sleep. When we found him next morning, he was still sleeping. We woke him up to tilt the cage and boot him out, but he was having none of that. He stayed. All in all, for a trap, it was an impressive abode. He went back to sleep. 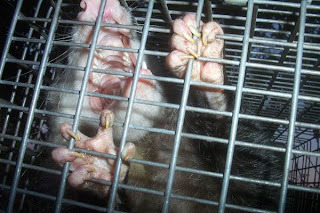 Then we started worrying about him being out in the light, so we got a blanket to put over the cage. And then we made sure he had some apple left. All day we turned the cars around next to the tree, the postman came in his truck and turned around right next to the tree, dogs barked - none of it mattered. Possum slept on, oblivious to it all, curled up under the blankie. He didn't leave until well after dark, some 10 hours later. And he left the blankie, but took the apples. 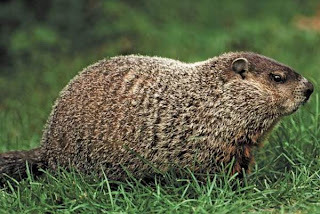 I am fairly sure I could hear the groundhog snickering over in his/her burrow. Found this photo in my file - Our World Garden -no idea where I got it from - but I'd love to have this as a poster. Now that my sad excuse for a garden is more or less done this year, it's time to put away the tools - clean them, sharpen them, perhaps sink them in a bucket of sand with a little oil thrown in. Some the tools pictured I've never seen in person and I haven't a clue what they're used for. Others I've seen hanging on the walls of sheds and workshops at estate sales. Once at an estate sale my mother found her perfect hoe - turned out it was a tobacco hoe with a narrow sharp blade in place of the more common 4-5" wide one. She loves it. This is my favorite tool. It's a heavy weight Japanese hoe, perfect for weeding, digging pant-size holes, moving mulch back around them. It's badly in need of a couple shims since the wooden handle has dried and shrunk after years of use, so occasionally the head loosens and slides down. I bought a replacement early this spring, but still reach for this one. Eventually the new one will get a chance to earn it's place. And this is the newest addition - a sortof short Japanese square hoe, also found at an estate sale. It hasn't been used, still has the stickers on it. The blade is about 3" wide and it's built better than it looks. Perfect for doing narrow rows of lettuce. The tools may not get a rest this year since I'm working on a plan to better insulate the greenhouse to produce all winter, and also grow some tomatoes and lettuce in my office. We have great southern exposure windows that might just work. My dream, of course, is to glass in the front porch and make it in a greenhouse all winter. Of course with global warming, our winters are being diminshed to a few weeks in January. Pretty soon we'll be gardening year round.